In an effort to let our patients get to know our staff and doctors better we’re starting a blog series called: Meet the Doctors / Meet the Staff. First up is Dr. Harvey Castro. 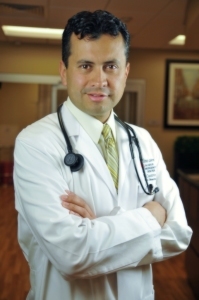 Dr. Castro works at The Colony location in Dallas. So, without further ado — let’s get to know Dr. Castro. Personal information: Has four children—is fluent in both English and Spanish. Early in your career, can you talk about a moment that made you realize, “THIS is why I became a doctor.” I used to work in a Latin community health food store. I learned about alternative medicine (vitamins, herbs etc.) and became fascinated with the science behind it all. I began to recommend different remedies to my family and friends. I knew I wanted to do more and help others and decided to go to Medical school. What were some of the challenges you faced during your residency, or even in medical school and how did you overcome these hurdles? The hardest part was the long hours without sleep—all the stress of working and keeping a sound mind with very little sleep. I am happy those days are over. You learn to adapt to your environment. As a resident, you rest when you can and you try to keep your mind and body as healthy as can be given the circumstances. Was there another career path you felt destined for at a young age? No, I always enjoyed serving others. How does working for Elite Care differ than other medical establishments? I have time to sit with my patients and I can take the time to get to know my patients. Elite Care’s culture reinforces all the principles that I would want from my doctor. The company focuses on providing best care and allowing physicians to focus on what’s really important to us: patient care. What do you do to mentally unwind from your job? I enjoy spending time with my family and watching my kids participate in sports. I also enjoy my time at church and reading. Elite Care is a unique facility in that it bridges the gap between a hospital and an urgent care clinic. Talk about the impact you think it will make on the community. The facility can take care of any medical emergency. It allows our physicians to provide top care you would receive at a hospital locally.